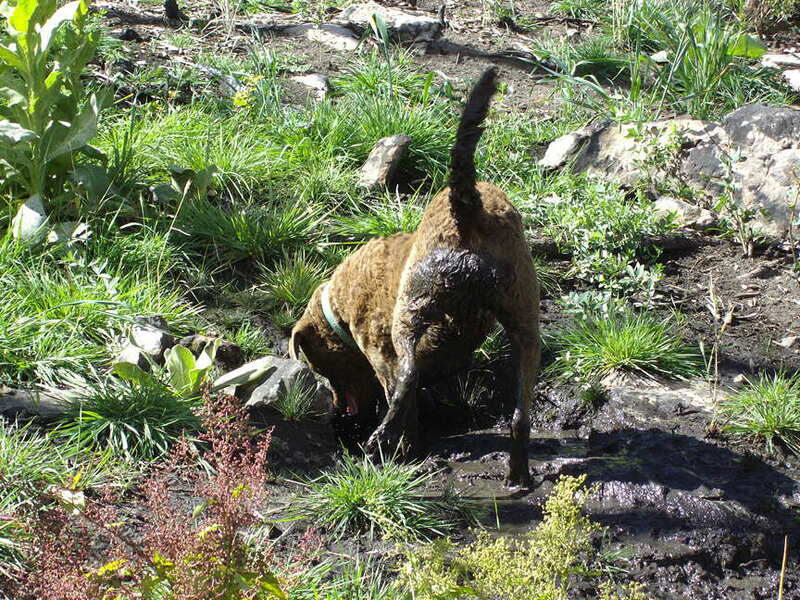 I hope you did not delete that great photo of Max on the glacier, because it's time for Mountain Gazette's sixth annual Mountain Dog Photo Contest. I have done this only informally with mushrooms, but there is a protocol for the Universal Edibility Test. It goes step by step. Related: "13 Survival Myths that Could Kill You." 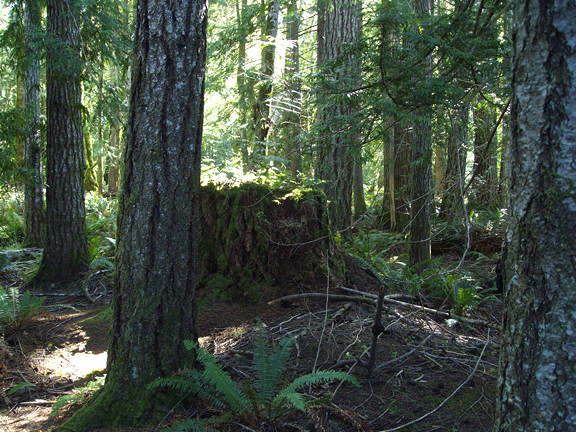 The west side of the Olympic Peninsula is the wet side, where the trees grow big — but sometimes just when I am thinking to myself about that, I look deeper in the woods and see the really big stumps. A few even still display the holes for springboards. 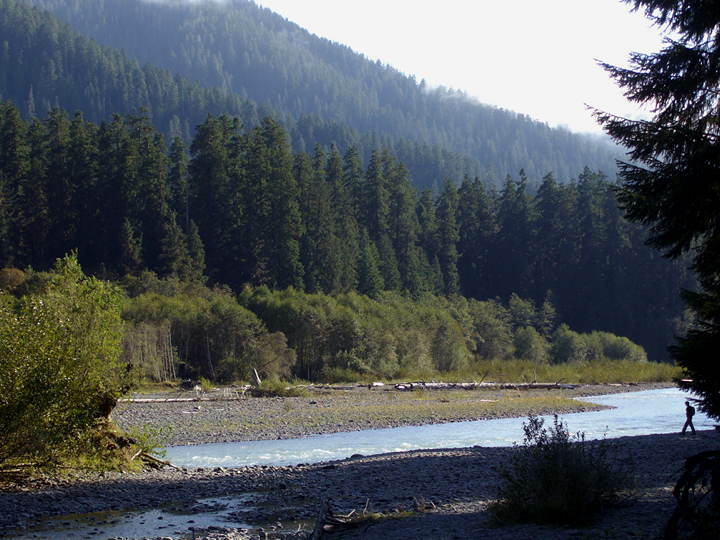 M. and I drove up the Hoh Rain Forest road into Olympic National Park and hiked a couple of short trails. The Hall of Mosses trail features a grove of bigleaf maples completely swathed in mosses, lichens, and every local variety of epiphyte. 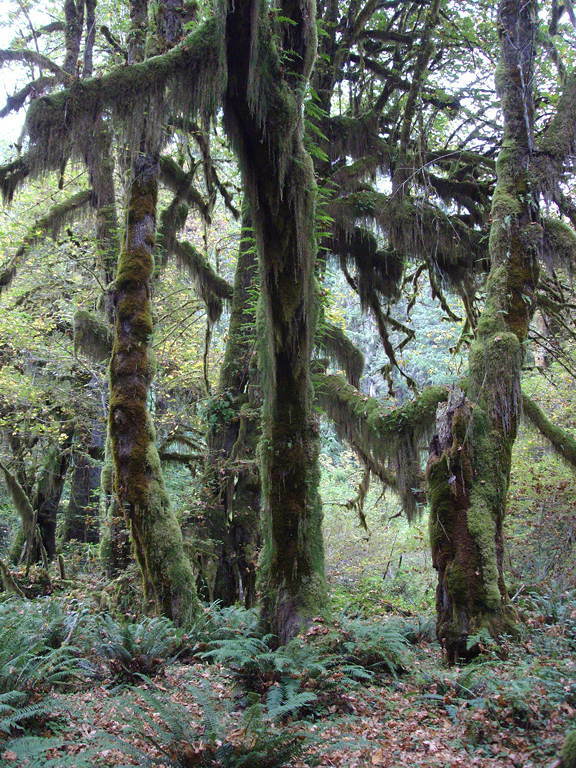 Says the Park Service website, "one criteria [sic] for the determination of a temperate rain forest is that the amount of moss and other epiphytes exceeds the weight of all the foliage (leaves and needles) per acre by at least two times." You don't often get a sunny day in the rain forest. Nearby Forks ("We brake for vampires") averages 212 days annually of measurable precipitation — about 107 inches (2.7 meters or 15.3 hands). 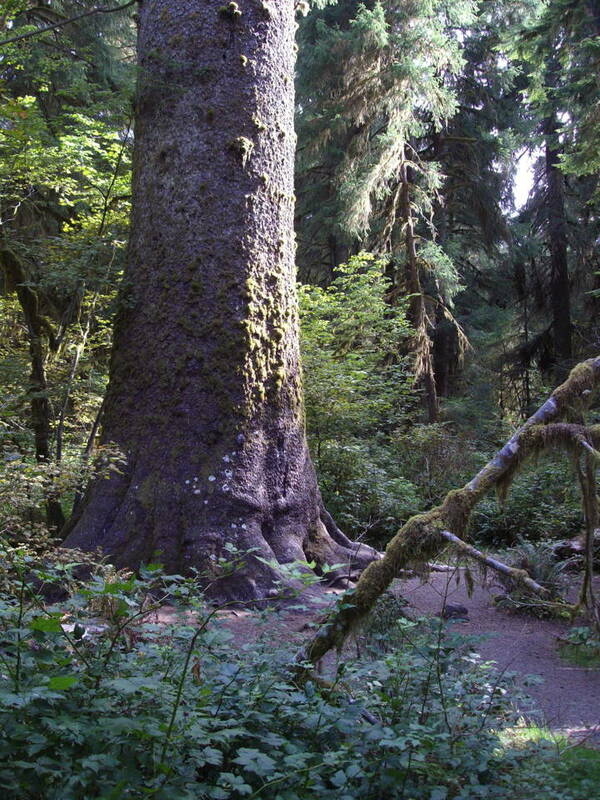 The Hoh forest itself averages 140 to 170 inches (12 to 14 feet). Walking around the Hurricane Ridge parking lot and then up the trail, I felt that my energy level was high. In fact, I was congratulating myself at how bouncy I felt up there at timberline. Then Rational Mind kicked in: "Dude, you're at a lower altitude than your house." Timberline is so much lower there, thanks to latitude and whatever other climactic factors. 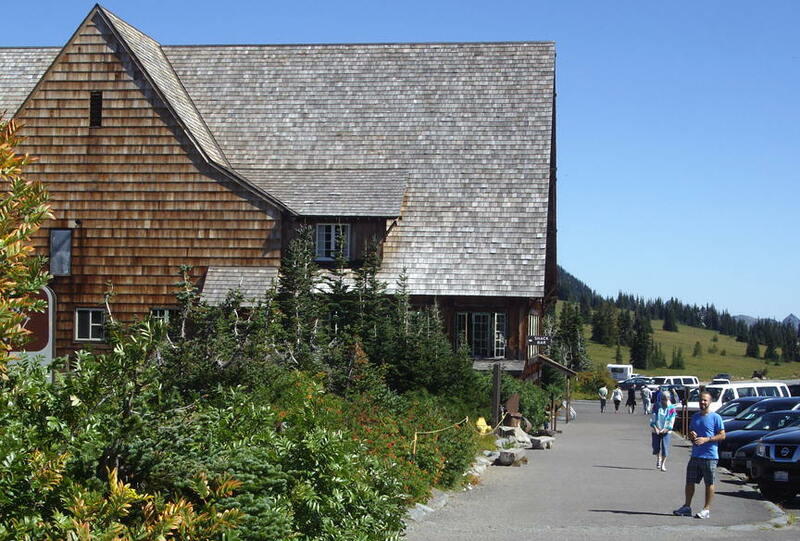 The visitor center is at 5,242 feet (1,911 varas, 1,598 meters), in other words, the same as the high plains city of Denver. Mt. Olympus is 6,900 feet but gets massive snowfall as storms sweep off the North Pacific. 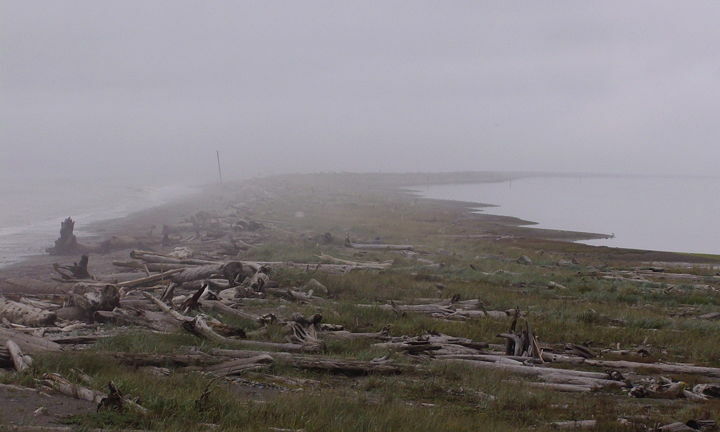 Looking north: the white streak is a cloud bank on the Strait of Juan de Fuca, while the dark strip on the horizon is Vancouver Island. Driving up to the ridge, I was trying to remember and reconstruct the last time I had entered Olympic National Park. It was between my freshman and sophomore year of college, and my girlfriend and I had driven up from Portland for a quick backpacking trip in her Volkswagen squareback. Did we car-camp the first night in the park? I know we hiked to some lake — Lake Angeles? Why did we go there? What did we eat? What did we talk about? All I can remember is camping beside some lake in the forest. And the "green tunnel" effect of driving on the Olympic Peninsula, which still struck me even after my first year in western Oregon. I was keeping a journal then, but I can't consult it, for it was one of the volumes that my mother trashed (and then lied about it) after I left them in my old desk at her house. So it goes. DENVER – Colorado Parks and Wildlife will offer exchanges or refunds and reinstatement of preference points for hunters in units and seasons adversely affected by the flood. Seasons included in this offer include Archery and Muzzle-loading deer, elk, and bear; Archery and Rifle bighorn sheep; and Archery, Muzzle-loading, and Rifle moose. Hunters can download the application for license refund. --Hunter must return a non-voided (i.e. carcass tag is still attached) license to CPW in person or postmarked by midnight, September 27, 2013 with the application for license refund request form or letter explaining request. --It is OK if hunters have already hunted as long as they have not killed an animal; hence the requirement for a non-voided license submission. --preference point(s) will be reinstated to pre-draw level and license exchanged to an OTC license or an available leftover in a different unit from the flood units. --a refund or exchange for an available license will be issued. Notification of these options will be made to hunters by mail, website, news release, and our Facebook page. CPW will notify all hunters as soon as possible. Information on over the counter and leftover licenses. The strong monsoon season has helped ease the drought. 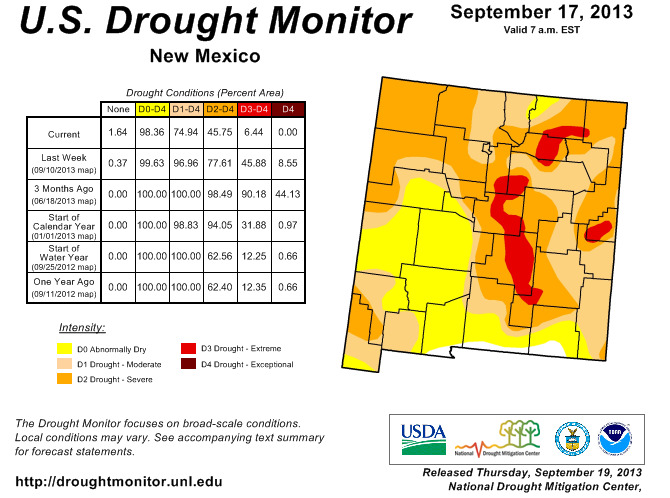 I see that our area has dropped from "severe drought" to "abnormally dry." The creek near our house faltered in mid-summer but recovered before going completely dry. A rancher neighbor says that he has been able to irrigate for a few days, although I am sure that he would rather have had that water in June. 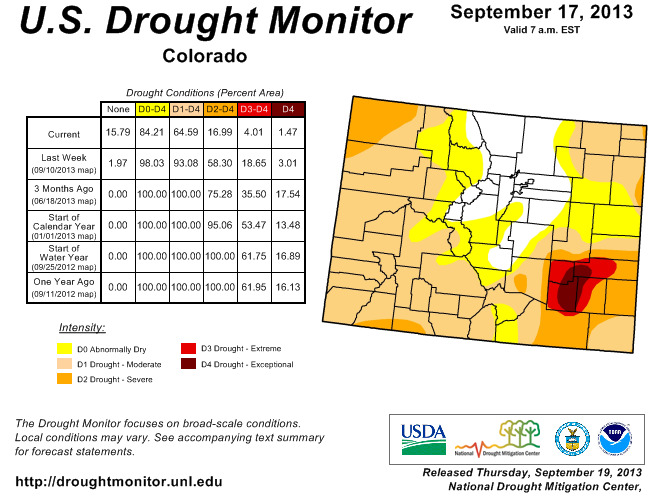 In northern Colorado, there is no drought at all! 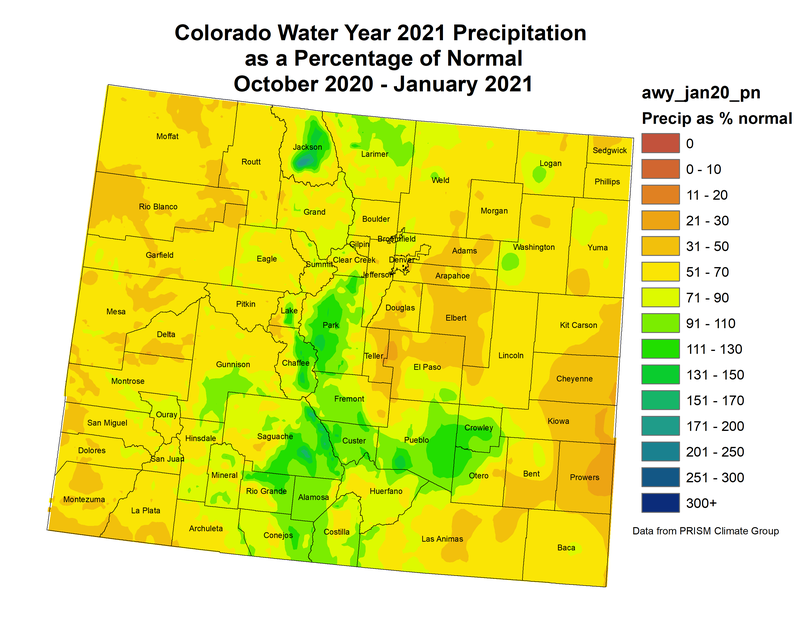 That happens when you get a year's worth of precipitation in a few days. 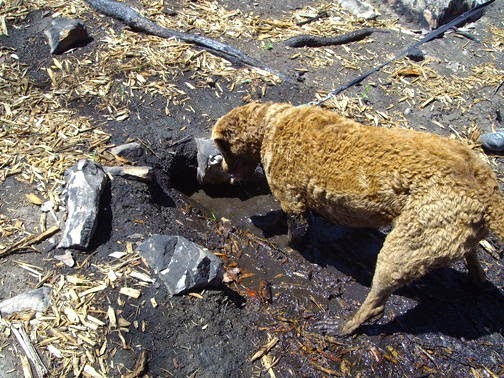 In fact, in some areas, soil moisture has been recharged the old-fashioned way. Then there is the oil-spill problem. TR's leather coat. It says so at the website. When I looked at the items on sale, I realized that except for the leather vest and the national parks atlas, I already have everything on the page or an equivalent garment. Right down to the pocket watch and the biography. Maybe I could substitute my leather-covered copy of David Sibley's bird book for the atlas. A woman in a coffee shop once told me that I looked like Teddy Roosevelt (really, I don't) when wearing an old four-pocket twill jacket that was made by, guess who, Orvis, but purchased on eBay. There is also a "trout bum" collection, but I somehow doubt if John Gierach gets a cut on sales. He did not invent the phrase, but he sure did popularize it. In a post titled "Big Data meets Bigfoot," Boing Boing summarizes "Bigfoot in Penn State PhD candidate Joshua Stevens's visualization of nearly a century of Sasquatch sighting reports in the US and Canada." Right away you can see that sightings are not evenly distributed. At first glance, it looks a lot like a map of population distribution. After all, you would expect sightings to be the most frequent in areas where there are a lot of people. But a bivariate view of the data (right) shows a very different story. There are distinct regions where sightings are incredibly common, despite a very sparse population. On the other hand, in some of the most densely populated areas sasquatch sightings are exceedingly rare. Go there for the interesting graphics. And as one commenter notes, maybe "the answer is likely game cameras, lots and lots of game cameras." 1. The repairs happen too slowly for my buzzy mammal brain to process. 2. The work is done at night by long-tailed voles with tiny wheelbarrows. 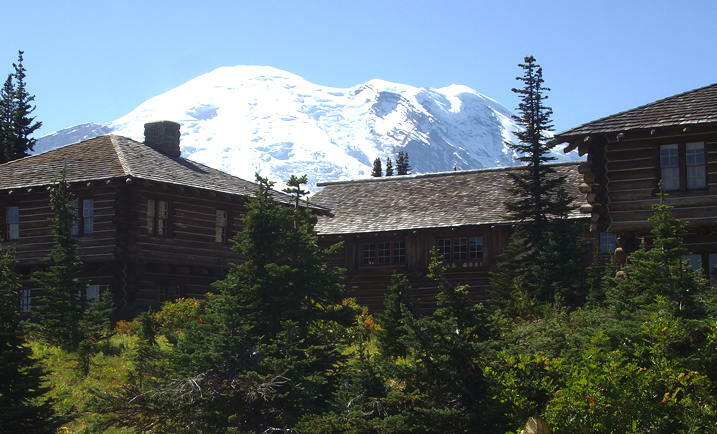 The "Yakima Park Stockade Group" buildings at Sunrise were built in the 1930s–1940s, modeled consciously on frontier blockhouses. I think that they would look familiar to a Roman legionary in first-century Germania as well — who thought that the roots of the National Park Service ran that deep? Sunrise Lodge was built in 1931, originally as part of a never-competed resort hotel. Behind me — but un-photographed — was a parkitectural "comfort station" that is also on the National Register of Historic Places. View looking NE into the Cascade Mtns. from Mount Rainier National Park. Said by the very urban poet Allen Ginsberg (1926–1997), whom the not-so-urban poet Gary Snyder in the 1950s coaxed into working one season as a fire lookout in the Cascades. The incident is found on p. 31 of Snyder's book The Practice of the Wild, which is on my hypothetical desert-island book list. And that whole brief era is described in detail in John Suiter's Poets on the Peaks. It was probably the same summer that the two of them encountered a party of anglers on a forest trail and Ginsberg intoned, "WE are forest beatniks." A line that I will never have the opportunity to use.